This picture is close up plan of terry towel’s surface. 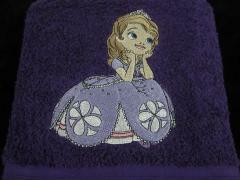 It is definitely created for little girl who loves magic fairy tales about princesses. That’s why Janine Stewart from Australia, author of this thing chose Dreamy Sofia machine embroidery design for its decoration. You may see all smallest details of this embroidery sample in this photo and imagine it on your own work piece. 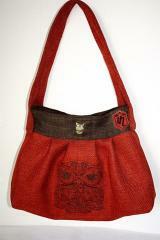 This is pretty embroidered woman’s bag with interesting design. It is based on contrast colors and executed from pleasant leather with relief surface. 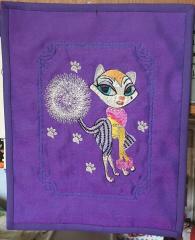 This idea is supported by Black kitty free embroidery design. This cute sample of fluffy kitten waiting for its owner is made in same color scheme. So this work piece made by Maike Murken from Germany looks as very well elaborated accessory for stylish girl. Comment: " oh, thank you Igor Denisov. 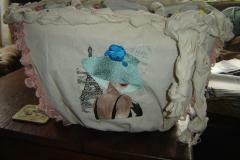 and here is my bag with the lovely cat"
There is another fragment of big and complex work piece. It is embroidered bed cover made in patchwork technique. Some of the patches used for this bed cover are standing out with just beautiful texture and deep purple color while the other are decorated with embroidered portraits. Here you may see Modern Fairy Autumn Dream embroidery design: the face of young lady with nice bouquet made of splendid autumn flowers in all their beauty. 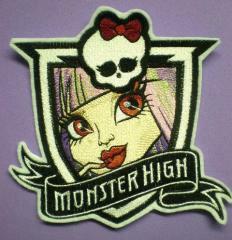 This is appliqué style badge with portrait of pretty girl with bright make up. You already recognize her: yes, she is one of character of popular animation movie for children and teens. 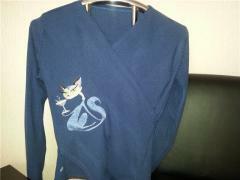 You may chose Rochelle Goyle embroidery design if your children love this cartoon. 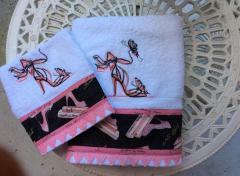 It is quite easy way to decorate their accessories or clothing by character from their beloved cartoon. This is nice summer clothing set made by Sabeha Robinson. It consists of convenient shorts and crop top. Both items are executed from thin natural material so this set is comfortable even in hot weather. Furthermore it is nice base for stylish look. Front part of top is decorated with Ballet dancer free embroidery design. It is very elegant and light picture but it is easy enough even for beginner. This is original embroidery based on usage of two samples of one picture. But they are executed in different techniques. 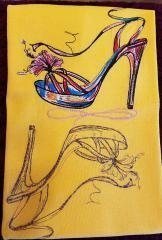 These samples are Be fashion embroidery design 5 and Be fashion embroidery design 4. Second one looks like colored version of first picture. They looks very impressive on bright background. 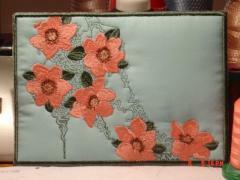 This embroidery will definitely be embellishment of ready work piece. On this picture you may see the back side of ordinary woman’s jacket decorated with Mosaic horse embroidery design. This is the portrait of strong horse of dark color with fluffy mane. It is added by some curves lines executed with shiny stones. This detail of embroidery definitely looks like the wild wind which is flying around the horse’s head and taking its mane. The same stones are used on the sleeves of this clothing. 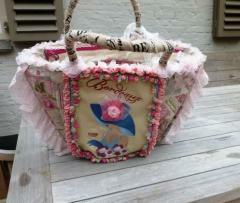 This is pretty embroidery design which is still on hoop. But author already finished it and now it is necessary only to remove it and iron. Fashion teddy bear machine embroidery design is finished! Fashion teddy bear machine embroidery design is interesting and bright picture which is especially good option to decorate clothing or accessories for little boy or girl who loves Teddy. 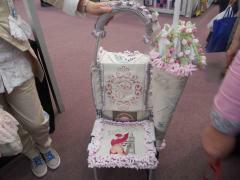 You also can use for decoration of home textile in children’s room. 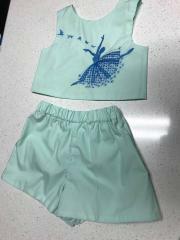 This is pretty set consists made by Elisabeth Hodl (Australia) of two little terry towels which are necessary for each girl. It is not just useful accessory for bathroom but also its stylish detail which is able to make this room original. Their design is very well elaborated. 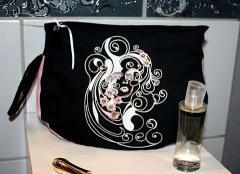 It includes elements made from printed fabric and Be fashion 2 embroidery design. Look how cool these pictures combine with each other. This is interesting woman’s leather bag which looks so rich due to original ornament. It reminds traditional ethnic motives of Arabic or other folks. Embroidered bag with free designs is not very difficult in execution but is will absolutely transform your bag or other accessory if you choose it for decoration. You also can change its color scheme or orientation.